We are an ILM-Approved Training Centre that delivers leadership and management training courses that can lead to the qualifications of ILM Award Levels 2, 3 and 5 in Leadership and Management or the ILM Level 3 Diploma in Management and Leadership. We also provide support towards your ILM Award or Diploma. ∗ Statistics taken from independent research conducted by Harris Interactive between September and October 2016 for the ILM. The ILM is part of The City and Guilds Group and is the management accreditation body formerly known as the Institute of Management and Leadership. All qualifications are awarded by The City and Guilds of London Institute. The benefits of achieving an ILM qualification are endless. You can view a full list of ILM courses by clicking here. In my role of Senior Account Manager I had the responsibility for the personal development and time management of ten colleagues, as well as for Ground Control’s customer satisfaction overall. It was suggested that I attend a management training course as part of my own personal development to acquire the skills to manage my own very busy workload and support my team. I really enjoyed the three ILM Level 3 leadership courses that I attended in London. The Impellus’ trainers were most engaging and provided a fun yet insightful learning experience. I found the course notes helpful and the format enabled me to refer to them easily when I was back in the workplace and while I was writing my ILM Award assignments. I didn’t start my assignments until several months after I had attended the courses, which meant that I needed to refresh my memory on the course content. I sought the advice of the Impellus’ Learning and Development Consultants, who were very helpful, knowledgeable and supportive and certainly steered me in the right direction. After that, it couldn’t have been easier to complete and submit the assignments. Ground Control had given us a deadline by which we needed to complete our Award and, as I was about to go off on maternity leave, I ended up putting myself under quite a lot of pressure, but it was worth it in the end and I would certainly recommend an ILM Award to anyone in a managerial role. I found the study interesting and didn’t find the assignments too daunting, as I had not long before completed my degree. As a result of attending the leadership courses and studying the ILM Award I certainly have more self-confidence. Not only did they provide me with valuable life skills, I learned how to communicate better and was able to develop more effective relationships with my team and colleagues. I found the psychology behind leadership and communication skills fascinating – I consider this now before I approach a situation, whereas before I tended to shoot from the hip! I have recently achieved the ILM Level 5 Award and found the experience to be both challenging, but also very rewarding. The two-day training courses I attended were engaging, informative and also fun. They provided a rare opportunity to be away from the office and to take time out to reflect. It was hard finding time to write the assignments, but once I got stuck in, I actually enjoyed it! Part of the Award was to seek anonymous feedback from my team – some of the comments were not what I had expected. However, this insight has provided me with a great opportunity to reflect on my style and approach. I have learnt a lot from undertaking the courses and assignments which are now helping me to improve as a manager. I would like to thank the Impellus team who gave me much encouragement and support along the way. The whole NGK management team has been studying the ILM Award Level 3 qualification for approximately a year. We are at different stages, some like myself have successfully completed with others in the process of submitting their assessments. I put aside a couple of hours at the weekends and disciplined myself to study over a 15-month period. 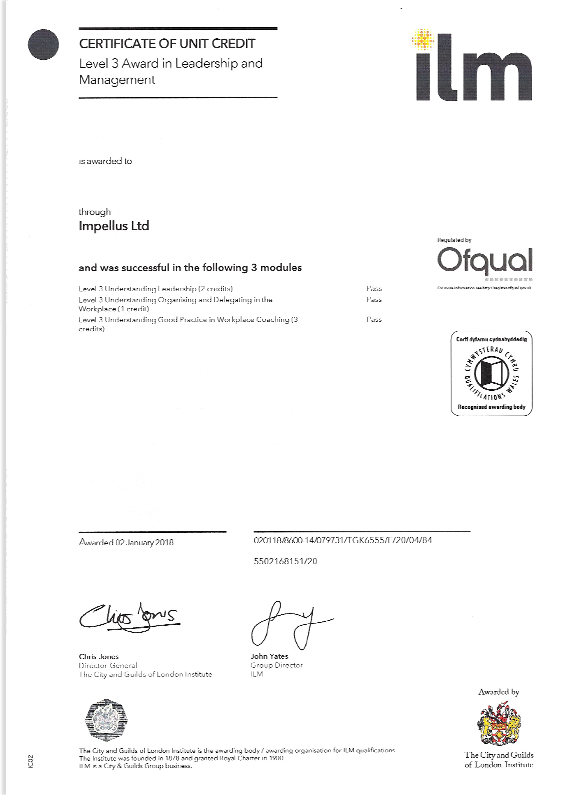 The Impellus Learning and Development Consultants supported me and provided very useful feedback after I had completed each module and before I made my submission to the ILM. I found the assessment work thought-provoking. It forces you to reflect on how you and your organisation approach management and offers you guidance for making changes. Other elements of the study provide a ‘standard’ to which you can aspire. It doesn’t give you an answer to every managerial challenge you will ever face, but it equips you with the tools to cope in the future. I had been working for Thomas St. John Ltd, in the London office, for just over three years when I was promoted into an assistant management position, due to company expansion. Thomas St. John is an accountancy organisation with three offices worldwide. I was conscious that, although a part qualified accountant, I was lacking in people management skills so I expressed an interest in attending some leadership and management training. The HR department researched courses and identified Impellus as a suitable training provider. The ILM Level 2 and 3 Award courses that I attended in London were great. The venues were good and the Impellus’ Learning and Development Consultants delivered interesting and engaging content. I was motivated to complete the courses and awards quickly due to other work and study commitments. I found the support from Impellus very helpful. The Award submission process was straight forward and the steps on the Business Centre were clear and easy to understand. On the occasions when I had questions or needed support, the team at Impellus always responded quickly. The ILM Qualifications have helped me to better manage my team and understand different methods and approaches to situations. I also gained more understanding of ways to give feedback, both negative and positive. The advice I would give to my colleagues (and other ILM Award participants) is to stay motivated and concentrate on completing the requirements of each course within a good time frame. Don’t leave it too long, as the information discussed and delivered in the courses really does help you to complete the assessment questions effectively. I definitely found attending the training courses and completing the Awards worthwhile. Working through providing both negative and positive feedback was most useful. I enjoyed using the performance issues diagnosis map, which will be so helpful in the future.